Baghdad. Capital of Iraq. One of the great cities of the Middle East. A battleground. Battle for Baghdad is set in the city of Baghdad in the period since the Coalition victory over Saddam Hussein. Your Objective: Gain control of the city. Use precision weapons, bribes, cellular warfare, terrorism, political spin, street demonstrations, and any other strategem you can implement to form a winning doctrine. 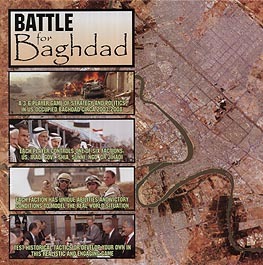 Battle for Baghdad can be played in seminars, classrooms, and at home for a rousing evening of full spectrum warfare and coalition infighting. Take command and win the Battle for Baghdad. Control One of Six Factions. You have the overwhelming firepower and technology, but can you win support of the Iraqi people while hunting terrorists in one of the world's largest cities? Now is your opportunity to bring the war to Americans! You can marshal a wide range of forces, from Al Qaeda terrorists to assorted criminals. War has left much of Baghdad without services. Rebuild the city infrastructure to advance your career. You control the ministers, but it's another thing to control the streets of Baghdad. Keep warring factions apart while building up your infrastructure. You control many Baghdad neighbourhoods, which you can turn into fortresses and battle it out with your enemies, including your primary rival, the Shi'ites. With the overthrow of Saddam Hussein, your time has come to seize control and settle old scores.